Sustainability – here to stay, or the issue of the day? We think it is here to stay. All the more important to be very critical about sustainability, and the meaning attributed to it by stakeholders. Do you remember how the general mood embraced biofuels, just ten years ago? The idea was that we would reduce CO2 emissions quickly with some bold measures. Ten years later question marks dominate, policy changes abound, the stability required by business for investments has evaporated – even though there still are staunch supporters. Therefore, doubts about sustainability should be voiced at an early stage, that would prevent stalemates ten years later. Difficult questions could be asked about the value pyramid and the ideas behind it. The idea is that we should use biobased resources in such a way that as much yield from the land as possible should be processed to products in the higher brackets of this pyramid; i.e. food, chemicals and materials, rather that bioenergy and biofuels. 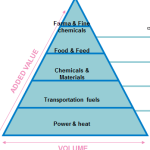 The value pyramid is used as an argument against biofuel policy. For this policy directs biomass to the lowest value brackets. Incorrect, a waste. But then there are the difficult questions. The value pyramid arranges biobased products according to their monetary value – but does that imply that acting according to this pyramid would carry the highest result in terms of sustainability? Or in terms of ethics (whichever ethic one would want to apply)? Some might think that we make trouble by raising such difficult questions – but then, they just might pop up if we would employ biomass for industrial use on a large scale. 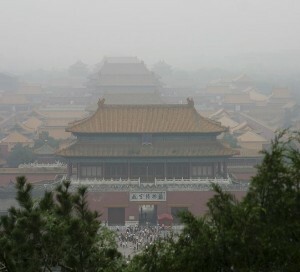 If sustainability problems arise (here: smog in Beijing), it is very difficult to identify the stakeholders who caused this problem. All these social aspects – including domains like the economy, sustainability criteria, mapping conflicting interests – are part and parcel of the ‘Innovation & Social Roadmap BBE’, which the partners to the work package Economy, Policy and Sustainability will draw up. They will elucidate the roadmap by a few cases. The Roadmap project is headed by Danielle de Nie of Natuur & Milieu (Nature & Environment) Foundation. Yes, the NGOs cooperate fully in the project. The roadmap will deal with ‘all non-technological requirements for innovation, in the areas of policy, regulation, economic aspects and social acceptance’. Its goal: to attain sustainable innovation and social acceptance. In order to identify obstacles for the biobased economy at an early stage. One of the projects in the work package that have a deeper look at sustainability is TBBF, ‘Towards a BioBased Future’, by Radboud University in Nijmegen. First, consider time scales, they suggest. Essentially, sustainability is about the long term – so in the short term, we cannot make reliable judgments about it. Pilot projects and lab tests do not give definite answers. And in the short term, major problems arise because hardly ever (except in the case of calamities) we can tell for sure which (market) parties cause certain sustainable or unsustainable effects. Does an ecosystem decline in quality? More often than not, there is a multitude of causes for that, which gives room to stakeholders to blame the others. Therefore it is a hell of a job to set satisfactory threshold values and standards for sustainability. Essentially, they say in Nijmegen, sustainability is a deeply political issue. Nobody knows where the ‘balance’ of people, planet and profit would be. Therefore, stakeholders can easily change the course of the debate: the debate on sustainability is full of rhetoric and one-sidedness. The only way out of that quagmire is characterised by experience, reflection and debate – as exercised by the participants in this ‘work package’.